"I say with full responsibility that Islamabad is a safe and secure city", so declared the Interior Minister Ch. Nisar Ali Khan in a press conference and ironically, only three days later the terrorists devastated his hollow claim by striking at the District Courts Complex Islamabad killing at least 11 people, including an Additional Sessions Judge Rafaqat Ahmed Awan and a 25 year old young lady lawyer Fiza apart from wounding 25 others some seriously with three lawyers also critically wounded amongst them . The one sided gun and grenade carnage lasted for nearly 45 minutes and the killers were at leisure to enter any office, court room or chamber – at places even asking the hapless victims to recite Kalima before killing them! Apparently no serious effort seems to have been made by the Police to stop the killing spree of the terrorists who made their escape good in the vehicles they had come to the courts. Strangely, there are conflicting reports about the exact number of the terrorists that played havoc at the courts. This is what the Honourable Interior Minister had to say of the incident in the National Assembly. He said that there was a huge difference between the intelligence provided by intelligence agencies and the police. According to the police two men entered a side lane of the district courts where they first fired into the air and then shot everyone who came their way. On the other hand, the intelligence agencies informed him that three men entered the premises; all had Kalashnikovs while the two of them wore suicide jackets also who blew themselves up while the third one ran away. However, according to an initial report of the police and intelligence agencies there were four armed men who entered the courts complex and two suicide attacks took place. Firing broke out after the blasts and the other two attackers fled the scene. What a confusion and what an intelligence shemozzle ?!! A force of 60 policemen are said to be deputed for the security of the Islamabad courts, out of which 47 were present on the day of occurrence. However, only one is reported to have fired at the terrorists and that too without any effect. Most others are alleged to have had defective w! eapons. Some policemen confided to the news reporters that they had orders not to open fire at their own. There were no CCTV cameras around, which had been incidentally ordered by the previous CJ Iftikhar Ch. about a year ago to cover all the courts premises. Surprisingly, they have been installed so promptly within two days of the incident! Where have these cameras come from? Anybody's guess! One thing is for sure that these could not been possibly procured and installed too at such a short notice unless all government procurement rules, regulations and procedures were flouted. The Secretary Interior informed the apex court that a police contingent was rushed to the scene of occurrence in 7 to 10 minutes from the nearby Margalla Police Station, which was scoffed at by the honourable court with the remarks that had they arrived that quickly the terrorists could not have done what they did. Now the question arises that were these 60 policemen or the contingent rushed from the nearby police station trained in any way to counter a well planned and executed terrorist suicidal attack or were they simply there just as a "show of force"? Were they to act (react) individually on their own or had they been organized and divided into various groups, sections and platoons etc. each with a specific task assigned to it? Did they have their specific 'Stations' to occupy during the operation, such as some vantage or high points affording good visibility and cover from terrorist fire or were they just to run around in the open exposing themselves fully to the enemy fire? Did they have any means of communications (wireless sets, Walkie/Talkies etc.) between themselves for effective Command and Control? Did they have any body armour (bullet proof vests) for their protection? Was there ever any exercise or rehearsal carried out against a mock terrorist attack? In short did they know what to do and how to do it? If not, then how do we expect such an untrained and ill-equipped force to counter any terrorist attack effectively? They will simply act like the cannon fodder and for that only the! ir senior officers are to be blamed. There is an old saying , "The greatest disloyalty a commander can do to his men is to launch them into a battle without proper training for it". تحقیق و تفتیش کے اس دوسرے مرحلے میں بہت کم سوالات پوچھے گئے جو تمام اسامہ بن لادن اور ملا عمر کے متعلق تھے۔ کہاں ہیں یہ لوگ؟ کیسے ہیں؟ کہاں تھے؟اور کہاں چلے گئے؟ اور عام طور پر طالبان کے متعلق کہ یہ لوگ کون تھے اور کہاں غائب ہوئے۔ اس کے علاوہ ایک سول جو مختصر تھا لیکن بار بار پوچھا جا رہا تھا وہ نائن الیون کے متعلق تھا۔"آپ کو اس واقعےکے متعلق کچھ علم ہے یا آپ نے کچھ سنا تو نہیں ہے؟"
یہ نظریئے' یہ احساس' یہ سوچیں' یہ افکاریہ' یہ درد' یہ آرزوئیں' یہ ولولے اور یہ تمنائیں کسی ایک شخص کے نہیں' ہر پاکستانی کی ہیں اور پاکستانی ہونے کے ناطے ہم سب اپنے ملک کی محبت اور عقیدت میں گرفتار ہیں۔ لیکن یہ بھی سوچتے ہیں کہ ہمارے ملک کی سرکیں' ہمارے وطن کی شاہراہیں' ہمارے دیس کی وادیاں' ہمارے کشور ناز کے صحرا' ہمارے پنجاب کے میدان' ہمارے سرحد کے پربت' ہمارے بلوچستان کے ٹیلے' ہمارے سندھ کے ریگزار قتل گاہیں کیوں بن گئیں۔ یہاں نفرتوںکے کانٹے کس نے بوئے؟ یہاں بارود کے دھوؤں میں ہم وطنوں کا خون کس نے بکھیرا۔ الفت و محبت کے نغموں کو بے سازوبے آوازکس نے کیا؟ ناقص اور غلط افکار کے آوارہ اور بے نسل ہاتھیوں کو دشت وطن میں دوڑنے کا موقع کس نے فراہم کیاکہ گلی گلی حسد وبغض کی خاک اڑنے لگی۔ تہذیب و تمدن کی بساط پر حیا سوزی کی آگ کون روشن کرگیا کہ ملت عریانیت اور فحاشی کی ناز بے کراں میں جلنے لگی۔ جدھر دیکھتے ہیں جسے دیکھتے ہیں' حالات کی ظلمتیں جیسے مقدر کے ساتھ کھیل رہی ہوں۔۔۔۔۔۔!!! مشائخ عظام! بچالو ہمیں۔ بچالو ہمارے ملک کو! ہماری ملت کو' ہم سنتے ہیں تمہارے پاس دین ہے۔ کہاں ہے تمہارا دین؟ بچاؤ بچاؤ کہ ہم جل رہے ہیں۔ ہم ڈوب رہے ہیں۔ ہمارا ملک بھنور میں پھنسا ہوا ہے۔ اسے نفرتوں کی چڑیلیں چمٹ گئی ہیں۔ اسے عصبیتوں کے سانپ کانٹ رہے ہیں۔ اسے علاقہ پرستیوں کے بچھو ڈس رہے ہیں۔ خدارا! مدد کرو۔ تم کب تک حسین بحثوں اور دلکش مناظروں کے سوداگر بنے رہوگے؟ اپنے علم کو زحمت آفرین مت بناؤ۔ رحمت پرور بناؤ' لفظ بازی کے میدان سے نکل کر قوم کی امامت کرو' دیکھو ساری قوم تمہارے دروازے پر کھڑی ہے' لگتا ایسے ہے کہ یہ چشمہ فیض بھی کبھی جاری تھا لیکن اب خشک ہوچکا ہے۔ محسوس ایسے ہوتا ہے کہ یہ دریائے رحمت کبھی انسانیت کو سیراب کرتا تھا۔ اب اس کے سوتے بے فیض ہوچکے ہیں۔ سمجھ یہ آتی ہے کہ یہ رسی کبھی خدا تک پہنچانے کا سلیقہ رکھتی تھی۔ لیکن اب اس کا اپنا ناتا عرش سے کٹ چکا ہے۔ رسم اذاں ہے روح بلالی رضی اﷲ عنہ نہیں۔ وجود نماز ہے قلب علی رضی ﷲ عنہ نہیں۔ ادائے زکواۃ ہے حکمت عثمانی رضی اﷲ عنہ نہیں۔ مناسک دین ہے فراست بوذر رضی اﷲ عنہ نہیں۔ شیریں مقالی ہے عشق حسان رضی اﷲ عنہ نہیں۔ اہتمام تدریس ہے تلقین غزالی رضی اﷲ عنہ نہیں۔۔۔۔۔۔!!! علمائے کرام ۔۔۔ مشائخ عظام! مجھے حفظ میں لے مجھے امن سے رکھ! میری باغوں کے گلدانوں کا' میرے صحرا کے آتش دانوں کا' میرے ذروں اور ستاروں کا' میری بہاروں اور گلزاروں کا' میرے جوبن مست پہاڑوں کا' میری قاری خو آبشاروں کا' میرے سپنوں اور میرے خوابوں کا' میرے آبی موروں اور مرغابیوں کا' میرا کون ہے تیرے سوا مولا!! BB Qureshi, the first Pakistani women to earn a PhD, silently made her final journey on Wednesday, causing a bet of stir as she spent her last years in the Edhi Old Home. After holding a PhD Trinity College in Dublin in Agriculture and Economics, she had worked in leading institutions of the world and that former UN Secretary-General Kofi Annan was among her numerous students. BB Qureshi was born into an educated family in Muradabad, India in 1922. She did her Graduation and Masters in Economics from Aligarh Muslim University. After earning her PhD, she came back to Islamabad where she taught for several years. Her first and last love was with education; hence, she remained single throughout her life. Besides national institutions, BB Qureshi served in African Universities for several years. After years of teaching abroad, she finally returned to Islamabad after years of teaching abroad, she was so disappointed at the standard of education that she decided not to teach anymore. After feeling rude behavior of her brother, BB Qureshi decided to shift from Rawalpindi to Karachi and opted to stay at Edhi Shelter Home. Every action of brave lady shows humbleness and kindness as she chose to share a room with women with special needs and psychiatric illness. In an interview to media a while back, she said that this was her home and she was happy to be there. After the news appeared on media, Governor Sindh Dr Ishratul Ebad offered her to stay at his house but declined. Her relatives had forced her to move in with them in December 2011 but she again returned to Edhi Home in February, saying that she would not go back to her family. An official of the Edhi centre said, "BB Qureshi wanted to be independent and not become a financial burden on anyone, not even her family. She was a jolly figure, always smiling and mingled with everyone". It seemed she was so disheartened by her family as she didn't want them to have her body and wished to be buried at the Edhi Graveyard. A legend lady made her final journey, mocking over the hurriedly changing culture of the society. MashAllah, he is from the elite of the elite, the Janbaz special forces trooper of Pak army. He has just come out of a fierce firefight with the CIA + RAW backed TTP insurgents, some where along the Pak Afghan border. 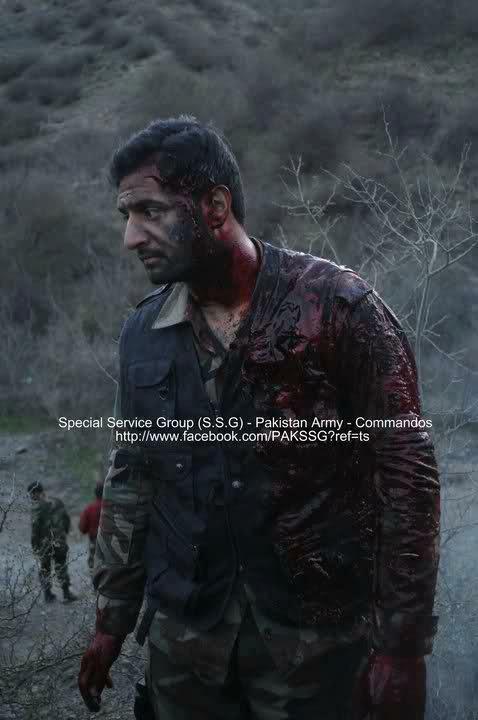 Wounded seriously on his chest and head, look at the peace, calm and serenity on his face for defending Pak Sarzameen with dignity and courage! Masha'Allah, May Allah shower infinite barakah and khair upon these sons of Pak army who are silently facing death everyday to defend our honor, faith and land without any expectation of reward or acknowledgement. By Allah, these sons are the finest souls Ummat e Rasul (Sallallaho Elahe Wasalam) has produced and are a source of Izzat for the entire millat! We stand with our sons and brothers in uniform and swear once again to live and die with dignity and honor. US, NATO, India, TTP, BLA and SAFMA can go to hell! NATO signs deals with Uzbekistan, Kyrgyzstan, and Kazakhstan to truck its military supplies from Afghan war out through Central Asia, giving it options instead of closed Pakistan route. NATO may not know the final result of its intervention in Afghanistan, but it now has an exit plan. And the exit will take place through Central Asia, the same route the Soviet troops took after their withdrawal in 1988 and 1989. As relations worsen between the United States andPakistan, NATO has signed deals with Uzbekistan,Kyrgyzstan, and Kazakhstan (see map here) to move out the tons of equipment that must be withdrawn by 2014, when NATO makes its final exit from Afghanistan. Speaking with Agence France-Presse news agency,NATO Secretary-General Anders Fogh Rasmussensaid that NATO now considers Central Asia and its Russian-built roads to be the most expedient route out of Afghanistan. "These agreements will give us a range of new options and the robust and flexible transport network we need," Mr. Rasmussen said. Tarnished by more than a decade of war, mutual recriminations, and foreign policy goals that are increasingly at odds, the US-Pakistani relationship now has reached a nadir. From the early post 9/11 days, when NATO received 90 percent of its supplies for the Afghan war through the Pakistani port of Karachi, now Pakistan has cut off NATO's old supply routes. Last November, Pakistan banned NATO's use of Pakistani territory after NATO planes mistakenly bombed a Pakistani post, killing 24 Pakistani soldiers. For Pakistan, the NATO bombing was the last straw, following the violation of its territorial sovereignty last year when US Navy SEALs captured and killed Osama bin Laden in the Pakistani city of Abbottabad. Pakistani officials complain that Washington simply cannot grasp the difficulty of reining in popular Islamist militant groups in a country that sees itself constantly under threat from outside. Washington fails to see the threat that Pakistan's larger rival, India, poses to Pakistan's very existence, and fails to understand how angry Pakistani citizens become after each successive aerial attack over their territory. For its part, Washington has come to see Pakistan as an unreliable ally, a country where the Pakistani military maintains ties with the very groups that attack US troops on Afghan soil, where America's biggest enemy, Mr. bin Laden, was taking up residence in a military garrison town. NATO and Pakistan could still patch things up. Pakistan has been hinting lately that there is still room for dialogue, with Pakistan's Foreign Minister Hina Rabbani Khar suggesting that the US simply needed to apologize for the November bombing of its troops. "For us in Pakistan ... the most popular thing to do right now is to not move on NATO supply routes at all. It is to close them forever," Ms. Khar told AFP in an interview. "If I were a political adviser to the prime minister, this is what I would advise him to do. But I'm not advising him to do that ... because what is at stake is much more important for Pakistan than just winning an election." Khar may not want to wait for an apology, given America's current election season. President Obamaseems disinclined, to say the least, and his Republican rival, former Massachusetts Gov. Mitt Romney – whose campaign strategy is to attack Mr. Obama as weak on national defense – is about as likely to push for a NATO apology as he is to push for gun control. So in the meantime, NATO is looking north, and expanding its options. Trucking out tanks, artillery pieces, and other military devices that were designed specifically to destroy theSoviet Union, on a route through the former Soviet states themselves, is not only rich with irony, it is also quite expensive. The cost of the northern supply routeis nearly double that of the Pakistani route, but at least it's cheaper than flying all that equipment out by air, which costs the US military $14,000 per ton. Posted on 02. Jun, 2012 by Editor. Posted on 02. Jun, 2012 by Imran Malik. Posted on 01. Jun, 2012 by Asif H Raja. Posted on 01. Jun, 2012 by Ayesha Villalobos. Posted on 01. Jun, 2012 by S M Hali. Posted on 31. May, 2012 by Jonathan Azaziah. Posted on 31. May, 2012 by Ellen Brown. Posted on 31. May, 2012 by Bakhtiar Hakeem. At KLIA (Kuala Lumpur International Airport) you must have seen these planes if been there? Dubai Skyline starts as soon you enter Dubai and never ends. Still lots of construction underway. Got the ticket to be on top. This card for ElectronicTelescope view it costs 50AED. Please don't buy it. Its of no use. Its just for three minutes and screen is very blur. Trust me you will waste you money don't buy it. Very nice gallery while moving towards Burj Khalifa. Whole gallery is decorated with slides on wall and Arab culture present in excellent way. 828 meters high? Did they spell it wrong? Metres? Dancing Fountain famous for its extraordinary dance on Arabic Music. If you visit Dubai Mall in evening must go there. There is a show after every half an hour till 10:00 PM. Can you see the Dubai Metro? And the Burj Al-Arab. Its amazing just amazing even more beautiful than Burj Khalifa. Burj Khalifa is high no doubts but Burj Alrab is just amazing. Although you can go inside for visit but you can take photos from outside. This hotel most of the floor owned by Armani so you must have bookings to go inside. Here comes the Ski Dubai. If you time and 200AED must visit this place. Its fun with a sand desert you can enjoy and Iceland or imagine to be in Switzerland for a while. There many thing to enjoy in 200AED ticket you can enjoy Chair Lift, Air Ball Slide and one more stuff i forgot but its very entertaining. Could Osama Mission Geronimo Have Revealed a Secret New Helicopter?